Since my YouTube video clip about organizing educational bins was highly popular, I thought I’d share another example of an educational display that is a science learning center. 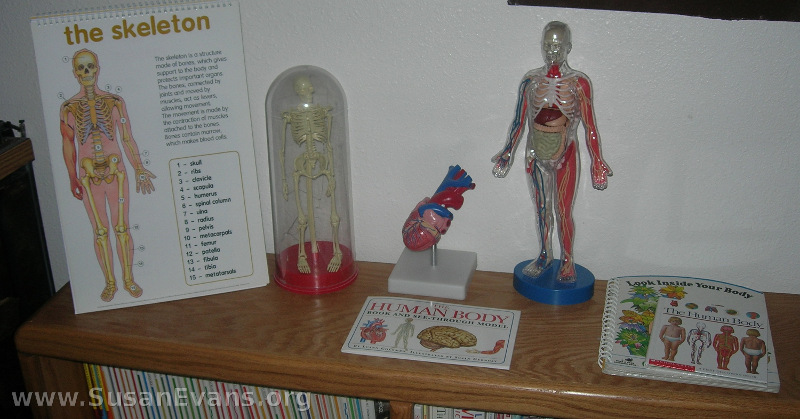 The bin that I showed you in the video clip was about anatomy, and here was the science learning center that I set up for my children during that unit. We had several fun books that had clear overlays with each system of the body. I had a skeleton model that I bought for a dollar at a used curriculum sale. The anatomy chart was purchased at a teacher supply store, and it helped the children to learn the different body systems, which they drew, life-sized, of their own bodies traced on butcher paper. The human heart opens up, and you can see the different chambers. This would be good for high school, too, because it was very detailed. I got that at a teacher supply store as well. Let’s see, oh, yeah, we also had a see-through model of the systems of the body. That was kind of frustrating, actually, even though the kids loved it, because it was hard to stuff all the body parts back inside. Anyway, I hope this display is helpful to you as you homeschool your own children and get them excited about learning a specific subject. If you would like more information on organizing your house to have more joy as you homeschool (and more fun!) feel free to get Organizing for a Fun Homeschool, two one-hour, jam-packed video sessions giving you a tour of my home and how I do things with my children. Many homeschooling mothers have come over to my house over the years, and all of them have taken lots of notes and asked lots of questions. I’ve answered everything in these videos. This entry was posted on Wednesday, September 15th, 2010 at 7:31 am	and is filed under Organization. You can follow any responses to this entry through the RSS 2.0 feed. You can skip to the end and leave a response. Pinging is currently not allowed. We have a similar skeleton model that kids like playing with. The way you set up this display would be great in my sons room! My kids love displays like this. It causes them to be interested in the topic.